Pokemon Go in Coeur d'Alene ID has become very popular. Many people thought it would blow over in a few days. Well its been a few weeks now and it is still growing. 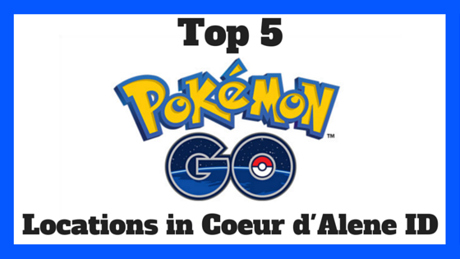 We are here to help with the Top 5 Pokemon Go Locations in Coeur d'Alene, ID. Whether you're a young player, older player reminiscing your childhood game, or a parent driving your kids around to find Pokestops, you can't escape it. Even people who don't play are constantly seeing hordes of people walking around (staying alert at all times of course). From driving Coeur d'Alene ID home buyers and sellers around the town, I am very experienced in all the locations around Coeur d'Alene. From what I can tell, Pokemon Go'ers are starting to look a lot like home buyers in Coeur d'Alene. It's hard to find a great place, and once you do, it's sold/overrun in no time. Looking to snag a few more Pokemon in between your Coeur d'Alene home search? When working with us we will be your eyes and ears in the Coeur d'Alene real estate market, and you can stay glued to your phone with and keep your attention on the real goal; a 150 Pokedex. Until they release the 2nd generation of course. Searching for Pokemon Go Pokestops, Gyms, and Rare Pokemon in Coeur d'Alene? Let's get started! Here are some of the best locations in Coeur d'Alene ID to Poke-hunt on Pokemon Go. The Coeur d'Alene City Beach, City Park, and Sherman Ave are a gold mine. Hand out downtown, walk around and have an endless supply of Pokestops. You can't get them all fast enough to beat the respawn. With constant Pokestop Lures showing up all over downtown, it's no surprise downtown has been packed with Poke-hunters. McEuen Park could be considered Downtown Coeur d'Alene but you could really spend all day there and never have to venture out of the park. Looking for a walk to hatch your eggs? Tubbs Hill has about 7 Pokestops throughout the hike alone. It is great for the Pokehunter on the move. Data got you down? The Coeur d'Alene library is a Pokestop and also offers free WiFi. Walking around NIC and Fort Grounds is an endless supply of Pokestops as well as great hard to find Pokemon. Follow Centennial Trail along the lake and river for numerous Pokemon and Pokestops with Lures always showing up. Looking to relax, get some sun, and stay clear of the countless Pokehunters? Sanders Beach offers a great spot to do so. With a much more private setting, Sanders Beach in Coeur d'Alene has 3 Pokestops and 1 Gym. This spot may be for the more casual players looking to enjoy the beautiful Coeur d'Alene summer in a quiet setting. Riverstone Park is a great location to Pokehunt. You can walk around the pond and hit around 6-9 Pokestops depending on your GPS accuracy. Mine always jumps around so if I'm quick I can snag a stop normally out of range. If you don't feel like walking, you can sit in a great spot that has 3 Pokestops in close range and they almost always have a Lure or two. If you aren't easily scared and are hunting for a Gengar. The Riverview Cemetery may be the spot for you. With 1 gym and 3 Pokestops in close proximity this is an easy spot to throw up a lure and wait for those Gastly's to show. This lesser known location may not have many Lures, but if you can stomach being in a cemetery after dark. It may be worth your while. I was there right after dark and caught 12 Gastly's in about 30 minutes. Looking to take a break from the hunt and grab a bite? Here are some Restaurants that are also Pokestops so you can collect those Pokeballs and hopefully and egg or two while you grab some food and restore some energy after all the hunting. This was so helpful thank you Gotta Catch Em All!